We can simply look at the photos on the front page of the Marianas Variety on August 13th and 14th to see what a difference good leadership and quality management makes. 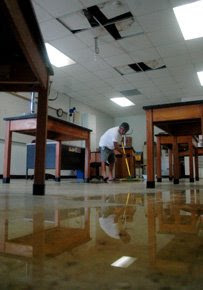 Complaints of leaking roofs in 60% of the classrooms! I've heard complaints that the walls are riddled with betelnut stains, too. And they need good teachers... The news article is silent about how many of the teachers at KHS have made the grade (passed PRAXIS, gotten "highly qualified" ratings). But it does tell us that the student-teacher ratio right now is at 37:1 (with last year's ratio being 33:1). When the power goes out, they'll be relying on a bio-diesel back-up generator, paying for that fuel. 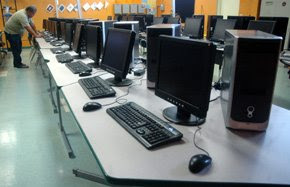 How many classrooms will that power up? But compare and contrast: Saipan Southern High School opened half a year later, in August 2002. They have no serious concerns about the physical state of the school because they have a good maintenance program. The campus is clean and well-maintained, and the students are required to be respectful of the physical plant. There's the possibility of learning, too. 26 of 29 teachers are highly qualified. Student-teacher ratio is 24:1. And looking ahead to power outages, SSHS will have windmill power available in approximately November, saving on the cost of utilities. So now all we need is for the Board of Education to figure out what it did right at SSHS and what it did wrong at Kagman High School. The PSS BOE needs to empower its principals and resist the temptation to micro-manage. Because when it allows GOOD principals to act, as at SSHS, the situation works to the benefit of all. But the BOE also needs to stop the politicking in appointments of principals (and the Commissioner?). And when a principal fails, as obviously is the case in Kagman High School since it's opening in 2002, the BOE needs to demote that person and put in someone who can do the job. Our students all deserve good schools like SSHS. And if SSHS can do it, there's no excuse for any of the others. You're too kind Jane.. you don't name names. Kagman High has had Doreen Tudela, who it sounds was preoccupied with filling her personal tills. Now they have Alfred Ada.. in my opinion, very weak. SSHS has had Peter Leau. Now on his own private time.. Mr. Leau is about the crudest rudest individual you could meet. When I knew him he was a hard drinker, who'd moon you at a wink. At school though, he brings typical Samoan strictness and expectations of respect by the students. This makes all of the difference in the world. That toughness carries on to his approach with the PSS Central.. Mr. Leau doesn't ask for supplies and equipment, he demands it, and he usually helps find a way to make it happen. In the cases of principals.. their performance isn't related to their salaries. You should see how much they make.. not publicized, but it's very substantial. There's no excuse for the underperformance that been displayed at Kagman and some of our elementary schools. There's a reason everyone tries to sneak their kids into San Vicente or Garapan Elementary Schools, and avoids like the plague Oleai and WSR. Consequently.. Mr. Ada was the principal of WSR for some time as well. I am tired of the nonperformance of the maintenece men too. Everytime I leave my classroom,I see them sitting on a bench somewhere in school. I am not the only one who has told the principal, yet nothing has been done. They expect us to pay them extra to buff the floors, where at other schools they do it as a part of their summer clean up. I was in school this week and needed the restroom but the office was locked because the power was out. I went to the one school restroom that was open and it had not been cleaned in months. MONTHS. The smell of urine was overwhelming. IT HAS BEEN ALL SUMMER AND THEY STILL HAVENT CLEANED IT. What have they been doing all this time? There are many people without work who would do a much better job than these guys. There is a joke at school that the maintence wokers are only there to keep the walls from falling as they are always leaning against them. Durring the school year more restrooms are locked than opened. We are violating laws and student rights. SOMETHING HAS TO HAPPEN.